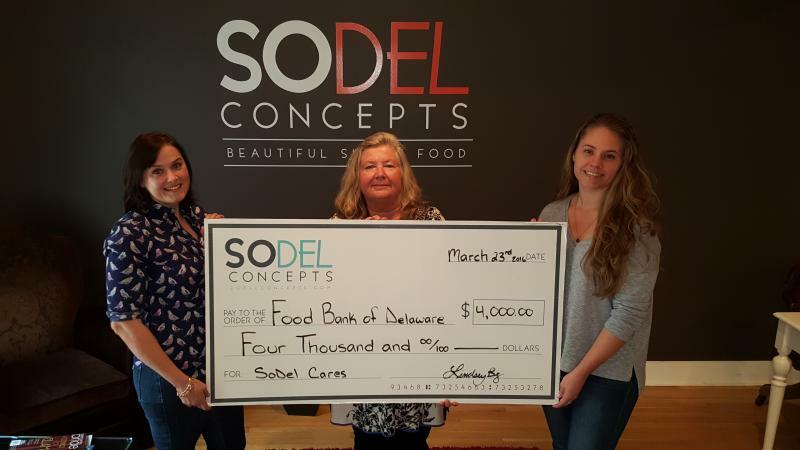 SoDel Cares, the philanthropic arm of SoDel Concepts, recently donated $4,000 to the Food Bank of Delaware, which provides nutritious food to Delawareans in need and facilitates long-term solutions to the problems of hunger and poverty. For the fiscal year 2014-15, the organization distributed 1,199,792 pounds of food in Sussex County, 1,340,434 pounds in Kent County and 3,620,036 pounds in New Castle County. “We appreciate all the work that the Food Bank of Delaware does in our community,” said Scott Kammerer, president and CEO of Rehoboth Beach, Delaware-based SoDel Concepts, which owns eight coastal-area restaurants, Plate Catering, the food truck Big Thunder Roadside Kitchen, and hospitality consulting and management divisions. “We know how challenging it is to stay on top of such a growing issue. So many children depend on schools and the Food Bank for nutritious meals.” In addition making the donation, SoDel Concepts employees also volunteer at the Food Bank. According to statistics on the Food Bank website, there are 122,310 food-insecure Delawareans. Some 71 percent have to choose between paying for food or utilities, and 30 percent have a household member who is either in the military or has served in the military. SoDel Cares was established in 2015 so SoDel Concepts could continue the philanthropic endeavors of founder Matt Haley. The company is dedicated to helping those in need in the communities in which it does business. For information about SoDel Concepts, go to sodelconcepts.com. For information on the Food Bank of Delaware, visit fbd.org. 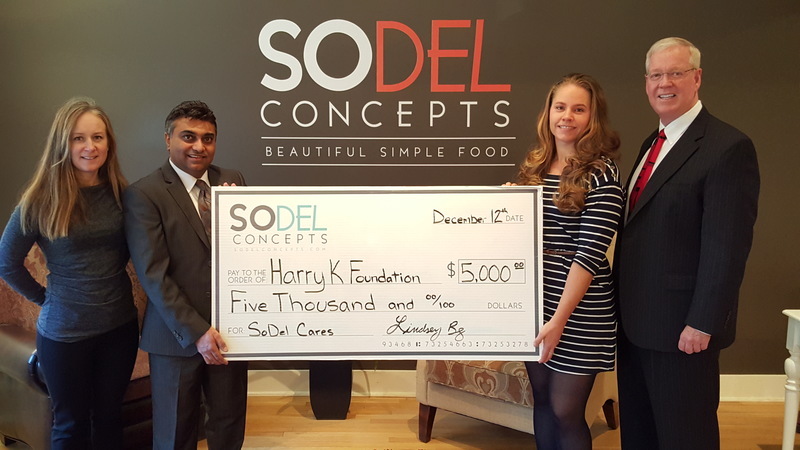 SoDel Cares, the philanthropic arm of the hospitality group SoDel Concepts, recently donated $10,000 to the Harry K Foundation. The Rehoboth Beach-based nonprofit is dedicated to helping Delaware children who are facing food insecurity, which includes hunger, irregular eating patterns and poor food quality. Founded by jeweler/entrepreneur Harry Keswani, the foundation donates all the proceeds of fundraising activities toward efforts to stop food insecurity in the community. The H4 Initiative supports the Delaware Food Bank to provide nutritional programming for children in Sussex County. The foundation has helped to open 24 food pantries in schools and locations throughout Sussex County. SoDel Cares was formed to honor SoDel Concepts’ founder, Matt Haley, a local, national and international philanthropist. For more information, go to www.sodelconcepts.com and www.harrykfoundation.org. SoDel Cares, the philanthropic arm of SoDel Concepts, recently donated $4,000 to the Rehoboth Beach Boys & Girls Club, which is located on Holland Glade Road, just off Route 1. "Our local Boys & Girls Club provides a wonderful service to families in our area, and they help kids realize their potential," said Scott Kammerer, president of SoDel Concepts, which has nine area restaurants and is the founder of SoDel Cares. "We are proud supporters of this organization, which plays a crucial role for working families in our community." Boys & Girls Clubs of Delaware, the state's largest licensed child care provider, offers affordable before-, after- and out-of-school programs for more than 30,000 youth in grades K-12 at 41 locations across Delaware. SoDel Cares was established in 2015 so that SoDel Concepts could continue the philanthropic endeavors of founder Matt Haley. The company is dedicated to helping those in need in the communities in which it does business. The foundation has donated thousands of dollars to charities benefitting children. This is the second year SoDel Cares has made a $4,000 donation to Rehoboth Beach Boys & Girls Club. For information about SoDel Concepts, visit sodelconcepts.com. For information about the Boys & Girls Clubs of Delaware, visit bgclubs.org. 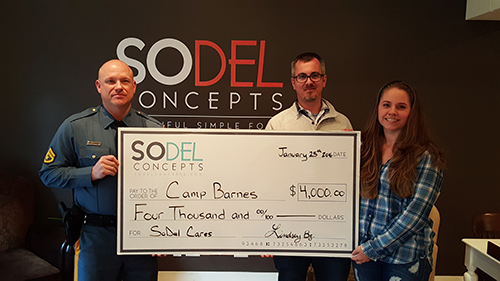 SoDel Cares, the philanthropic arm of the hospitality group SoDel Concepts, donated $4,000 to Camp Barnes, a summer camp run by the Delaware State Police for children ages 10 to 13. For six weeks, from early June until August, about 60 children per week attend the camp at no charge to their families. Located on Millers Creek, a tributary of Little Assawoman Bay in Ocean View, the camp’s activities include swimming, kayaking, archery, crabbing and fishing, sports, and arts and crafts. For information about SoDel Concepts, go to sodelconcepts.com. For information about Camp Barnes, go to campbarnes.net. SoDel Cares, a charitable foundation founded by SoDel Concepts, recently donated $4,000 to the Food Bank of Delaware. The culinary program teaches underemployed and unemployed individuals the skills they need to get a foothold in the hospitality industry. In addition to running the culinary school, the Food Bank provides low- and no-cost food to qualified programs in the state, raises awareness about hunger and food security issues, mobilizes support for anti-hunger efforts, and develops and implements a statewide nutrition program to assist low-income families, individuals and children. SoDel Concepts’ foundation, SoDel Cares, recently donated $4,000 to the Food Bank of Delaware. 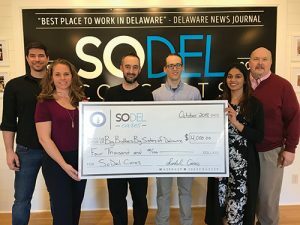 The hospitality company presented the check when students from the nonprofit’s culinary program visited SoDel Concepts’ offices in Rehoboth Beach. The hospitality company presented the check when students from the nonprofit’s culinary program visited SoDel Concepts’ offices in Rehoboth Beach. The culinary program is part of the Food Bank’s mission to find long-term solutions to end hunger and poverty. The training encourages under and unemployed Delawareans to find jobs in the food service industry. During their visit, the students met with the corporate team and got a behind-the-scenes look at how a large hospitality company like SoDel Concepts manages its back office. Patricia Beebe, the CEO and president of Food Bank of Delaware, is grateful for the partnership with SoDel Concepts. “From accepting our culinary students for internships to coming into our culinary class to do demonstrations to working with us on events and donating financial resources, we know we can always count on the team at SoDel Concepts,” she said. The Global Delaware Fund, founded by Matt Haley and Scott Kammerer of SoDel Concepts, presented a check for $1,000 to the Rehoboth Elementary School Art Docent Program. The money was raised at the Feb. 19 Women & Wine event at Lupo di Mare Italian Kitchen, one of SoDel Concepts’ eight restaurants. The Rehoboth Elementary School Art Docent Program introduces art history and art discussions into every classroom. Involved parents write seven lessons a year on an artist or a style of art. They also come up with an idea for a related art project for the students. About 40 docents teach the lessons, discuss the artwork and supervise the art project. Each year, there’s a theme. For the 2014-15 school year, students are learning about American artists. Past themes include architecture from Ancient Greece to the 20th century, and female artists from the Renaissance to the present. The crowd came not only to support the organization but also to enjoy a four-course meal with complementary wines, which included tuna crudo, baby kale salad, roasted porchetta and mascarpone panna cotta. The evening also included a raffle with prizes donated by moms who participate in program, including Tiffany Caldwell of Tiffany Caldwell Photography, Kelly Bisaha of Henlopen City Oyster House, Jeane Cohen from Bad Hair Day, Lori Dinger, Karen Falk, Christina DiSalvo, Jen Barrows and Liza Dolan. Mike Dickinson, director of operations for SoDel Concepts, and Kammerer donated two Lupo gift certificates, and Dave Hill of Outlet Liquors also donated a prize. It’s all part of the way SoDel Concepts does business, Kammerer said. “This is what we are all about: Creating beautiful, simple food, giving our employees opportunities to show their talent and giving back to others.” For more information, go to sodelconcepts.com. SoDel Concepts, the restaurant group founded by Matt Haley, has donated $10,000 to The Freeman Stage at Bayside in Selbyville. 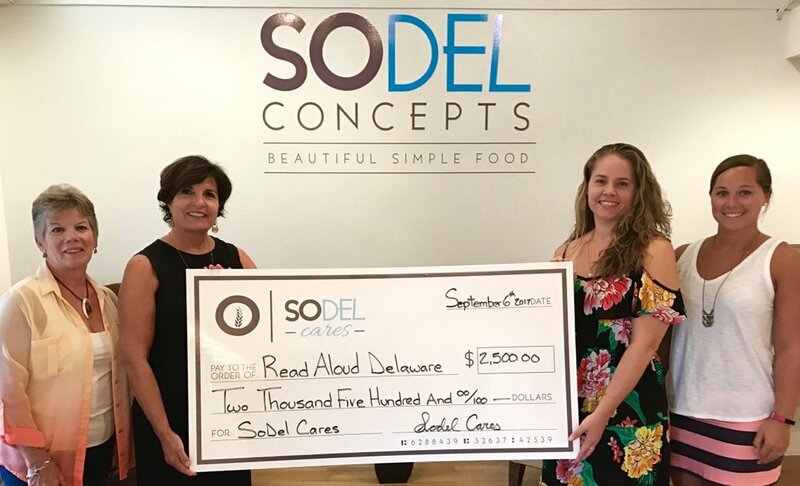 The Rehoboth Beach-based company, which owns nine restaurants along the Delaware coast, donated the money through its philanthropic arm, SoDel Cares. "Thanks to The Freeman Stage, there has been an explosion of performing arts offerings in coastal Delaware," Scott Kammerer, president of SoDel Concepts. "We're particularly appreciative of the good work that the organization does for area schools. For many of the children who attend the free shows, it's their first exposure to the arts, including classical music, opera and dance. The SoDel Cares Fund, a nonprofit, helps children in Delaware and across the globe. Many of the fund's efforts address hunger and sustainability. REHOBOTH BEACH — SoDel Cares, a nonprofit foundation, recently donated $4,000 to Surfers Healing, which holds volunteer-staffed surf camps for more than 4,500 children with autism. Founded in 1969 in Southern California, the organization holds a Surfers Healing Day in Ocean City, Maryland. Rehoboth Beach-based Quiet Storm is an active participant. “We appreciate the joy that Surfers Healing brings to the children who both live here and who visit our community,” said Scott Kammerer, president of SoDel Concepts, a hospitality company with 10 restaurants on the coast and The Clubhouse at Baywood in Long Neck. Kammerer is the founder of SoDel Cares, which is managed by the Delaware Community Foundation. Many children with autism struggle with sensory overload, and the ocean’s buoyancy and rhythm seems to soothe them Kris Medford, the general manager of NorthEast Seafood Kitchen in Ocean View and an avid surfer, first brought Surfers Healing to the hospitality group’s attention. SoDel Cares will hold its third annual fundraiser on Friday, Nov. 17 at Fish On in Lewes. The evening will feature silent and live auctions. A $25 donation is suggested. For information, see SoDel Concepts’ event calendar at sodelconcepts.com. For information on Surfers Healing, visit surfershealing.org. SoDel Cares, the philanthropic arm of the hospitality group SoDel Concepts, recently donated $5,000 to Meals on Wheels Lewes-Rehoboth. Organized in 1970, Meals on Wheels of Lewes-Rehoboth in its first year delivered 16,609 meals. By the end of the 1970s, more than 20,000 meals per year were being distributed. Today, there are more than 200 clients. Drivers and partners deliver two meals to each on 13 routes in Sussex County. SoDel Cares was formed to salute SoDel Concepts’ founder, Matt Haley, a local, national and international philanthropist. For information about SoDel Concepts and SoDel Cares, visit sodelconcepts.com. For information on Meals on Wheels Lewes-Rehoboth visit mealsonwheels-lr.com. Based in Rehoboth Beach, Delaware, SoDel Concepts has 10 coastal restaurants. SoDel also has Plate Catering. Other divisions include Haley/Kammerer, a hospitality consulting firm, and Highwater Management, a hospitality management company, as well as SoDel Films, Matt’s Homemade Soda Co., a line of artisanal sodas, and SoDel Salts, a line of gourmet seasonings. 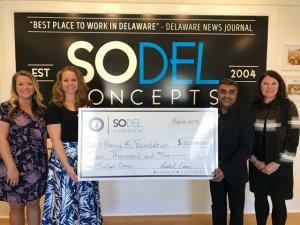 SoDel Cares, the philanthropic arm of SoDel Concepts, recently donated $5,000 to the Harry K Foundation, a Rehoboth Beach-based nonprofit dedicated to helping Delaware children who are facing food insecurity, which includes not only hunger but also irregular eating patterns and poor food quality. Founded by jeweler/entrepreneur Harry Keswani, the foundation has helped open 15 food pantries in schools and locations throughout Sussex County. SoDel Cares was established in 2015 so SoDel Concepts could continue the philanthropic endeavors of founder Matt Haley. SoDel Concepts is dedicated to helping those in need in the communities in which the company does business. For more information on SoDel Concepts, go to sodelconcepts.com. For information on the Harry K Foundation, go to harrykfoundation.org. 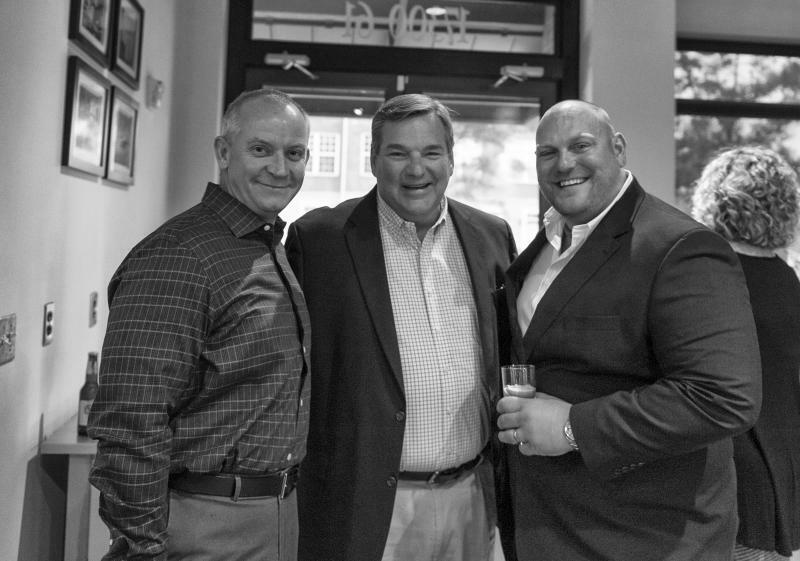 SoDel Cares held its second annual fundraiser Oct. 1 at Fish On in the Villages of Five Points in Lewes. Fish On is one of the nine restaurants owned by SoDel Concepts, which started SoDel Cares in 2015 to honor the company’s founder, the late Matt Haley, who was nationally recognized for his philanthropy. In its first year, SoDel Cares donated funds to local charaties that benefit children, at-risk youth, adults re-entering society from the prison system, and the elderly who need assistance. Some of the beneficiaries include The Harry K. Foundation, Primeros Pasos, Pathways to Success, Meals on Wheels Lewes/Rehoboth, Surfers Healing and Camp Barnes. "We are overwhelmed by the outpouring of support we received this year from our community. We received donated goods and services from so many fellow business people and friends, and the turnout for the event was amazing," said Lindsey Barry, SoDel Concepts controller, who has been with the company for more than 11 years. "This year's event was a great party, filled with local business people, state representatives, volunteers from community-based charities and SoDel employees. I think everyone had a really good time." SoDel Cares is managed by the Delaware Community Fund, an organization dedicated to facilitating philanthropy throughout Delaware. The Matthew James Haley Trust announced it will match funds raised at the event, and SoDel Concepts also pledged to donate a matching amount, tripling the total earnings for the evening. To make a donation to SoDel Cares via the Delaware Community Fund, go to www.sodelcares.com and click on the donate button. To mail a donation, send a check payable to SoDel Cares; c/o Delaware Community Foundation, 36 The Circle; Georgetown, DE 19947-4393..
Activities at the camp include swimming, kayaking, archery, crabbing and fishing, sports, and arts and crafts. Campers also view demonstrations by Delaware State Police K-9 and Evidence Detection Units, and Delaware Division of Fish and Wildlife. The Delaware Attorney General’s Office and the Girl Scouts of America also provide demonstrations and classes. Brenton Lyman, general manager of Matt's Fish Camp, one of SoDel Concepts’ restaurants in Bethany Beach, brought lunch to the campers and did a summer cooking demo. Lyman is also a chef. SoDel Cares was formed to honor SoDel Concepts’ founder, Matt Haley, a local, national and international philanthropist. For more information, go to www.sodelconcepts.com and www.campbarnes.net.